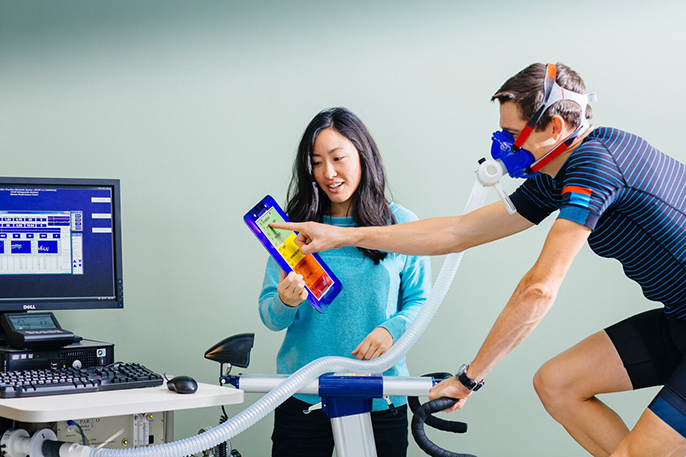 UC San Francisco sleep expert Cheri Mah, shown here with cyclist Kurt Wolfgang, studies sleep and performance in elite athletes, and consults with professional sports teams to improve their athletes’ sleep habits. Do you want an easy way to improve your game? Get a bit more sleep, and the results could surprise you. UC San Francisco sleep expert Cheri Mah, who consults with the Golden State Warriors and other elite athletes, has found that extended sleep can improve free-throw and three-point shooting by 9 percent. Mah, who studied under Stanford sleep guru Dr. William Dement, conducts research at UCSF’s Human Performance Center with Dr. Anthony Luke on sleep and performance in elite athletes. She applies her expertise to help the world’s best athletes gain a competitive edge. A growing list of professional teams in the NBA, NFL, NHL and MLB are turning to Mah to fine-tune their athletes’ sleeping schedules. And while her advice might not transform the rest of us into the next Stephen Curry or Andre Iguodala, “healthy sleep is important for everyone,” said Mah, a Clinical and Translational Research fellow with the UCSF Clinical and Translational Science Institute. To step up your game, follow Mah’s six tips for better sleep. 1. Sleep at least seven hours a night. Elite athletes should get even more. 2. Maintain a regular bedtime and wake-up time. 3. Implement a wind-down routine. 4. Evaluate your sleep environment. 5. Reduce your intake of alcohol and caffeine.